Ben Duckett admitted his disappointment at missing out on a double hundred in the first day of the County Championship Division Two clash with Essex. 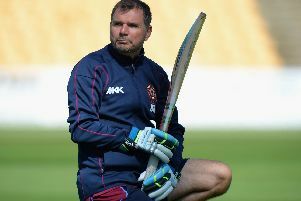 But the Northants star was pleased that his positivity paid off in a superb 189 against the table-toppers. The 21-year-old’s impressive knock was supplemented by 75 from fellow opener Rob Newton and an unbeaten 49 from Josh Cobb. Northants ended the day in control on 376 for five, but they lost late wickets, with Ravi Bopara taking four for 64 from his 20 overs. And Duckett was frustrated that he won’t still be in the middle going into day two. “I was fairly uninterested this morning,” he said. “I’ve been in poor form, had a few low scores, so I just tried to go out and be positive. “The leave is still the shot I’m learning the most in four-day cricket and I did that a bit better until they bowled straighter which I prefer. “The last few games here have been on dead wickets but it was easier to time the ball here.